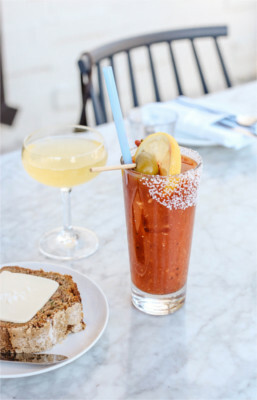 Whether you want to sip a socially acceptable cocktail with breakfast or nurse a brooding hangover, the Bloody Mary has become the standard go-to. The drink that has been around since approximately 1921 has incredible diversity, and it seems as though just about every restaurant has their own version–with our city being no exception. 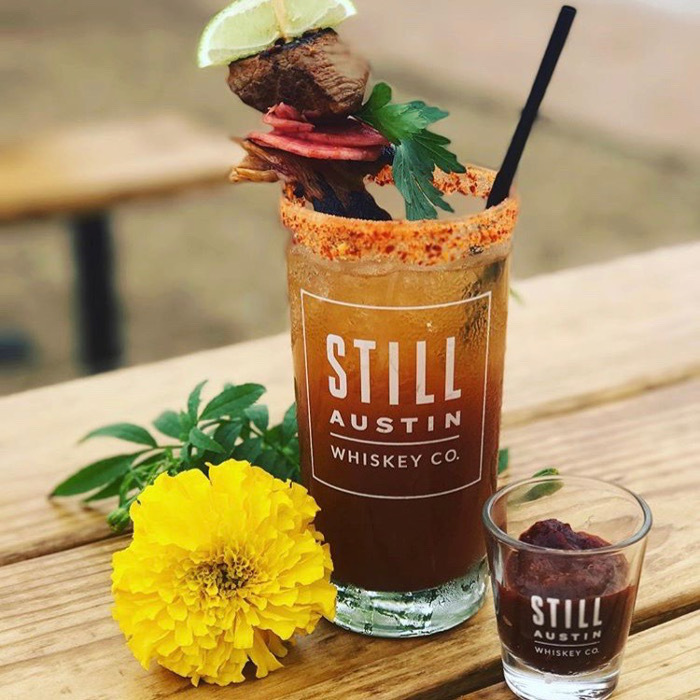 So whether you’re looking for the classic version, a peacock of garnishes, or something more exotic, here’s our guide to the best Bloody Marys in Austin. Thank you to the bars featured in this article for allowing me to sample their drinks at no charge. All opinions are my own. 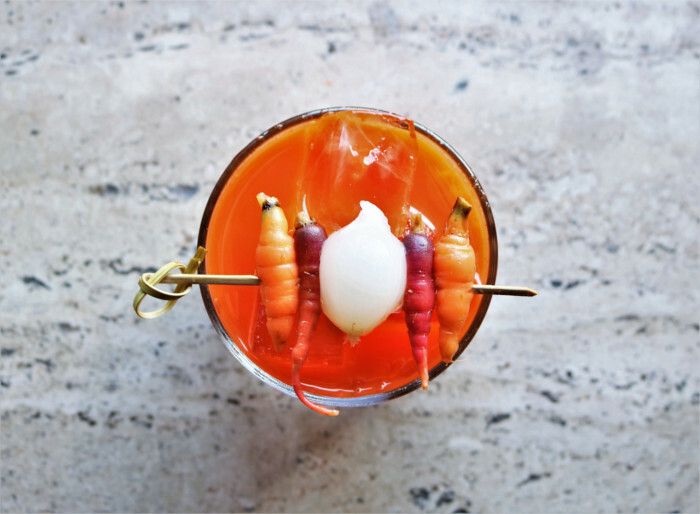 Purist looking for a Bloody Mary without fancy garnishes or unusual ingredients? Then head to the following establishments in Austin. If you find yourself in the Second Street District when your craving for Mary kicks in, then pull up a chair or bar stool at Second Bar + Kitchen. This Bloody Mary is as classic as it gets. The only unexpected change is the use of celery bitters to make the drink slightly lighter and more refreshing than usual. I’ll take it. 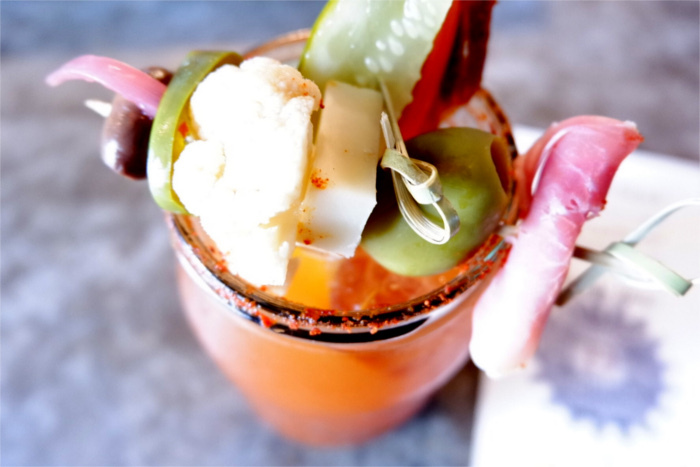 Everyone’s favorite South Congress taco bar serves up a delightful Bloody Mary. Who knew? I sure didn’t, and I’ve been stopping by for years to sit and watch various ladies beat masa into submission, as they make heavenly corn tortillas appear before my eyes, while I drink a margarita and nosh on chips and salsa. Güeros calls its red, tomato concoction the Texas Bloody Mary. It’s a combination of Tito’s Handmade Vodka and a house mix. I recommend pairing the drink with tacos al pastor, although it would probably go with anything on the menu, since this food is plain delicious. Just don’t call it Tex-Mex! This 30-plus-year-old taco bar and its dishes were developed to be reminiscent of cantinas you’d find in interior Mexico. 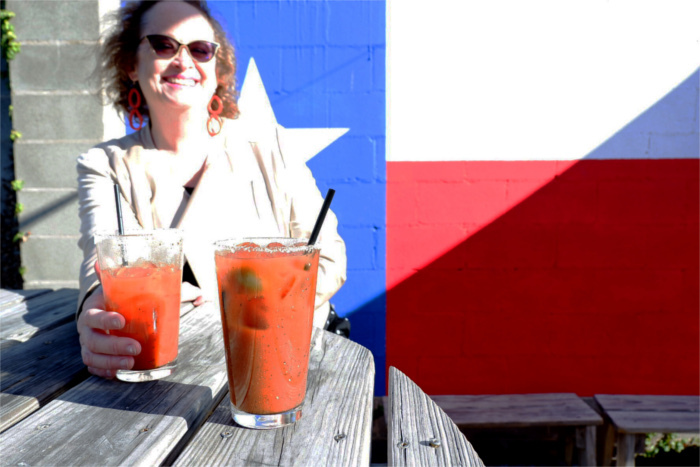 Fellow Contributing Blogger Joleen Jernigan enjoys a classic Bloody Mary on Lustre Pearl’s patio. No frills, all flavor—that’s exactly what you’ll get if you order up a Bloody Mary at this east Austin establishment. Lustre Pearl uses its own homemade mix, then adds fresh pepper and spices. For best results, ask ’em to make yours with Dripping Springs Vodka BECAUSE Texas! Just a bloody good cocktail is what you’ll find at this converted laundromat diner. Launderette managed to achieve a perfect balance of salty and sour, with rich notes of tomato. The east side eatery forgoes ostentatious garnishes, and opts for a wedge of lemon, pickled tomato, a thin slice of cucumber, and a bit of salt. Simple, but sophisticated. Some have dared to call it the best in town. Hangover woes, be gone! backYARD at Waller Creek can help with a glass or carafe of Backyard Bloody Mary, featuring infused vodka and a secret house mix. Enjoy one as you enjoy backYARD’s garden-style seating, a unique lawn atmosphere with enchanting skyline views. If you like add-ins and options in your Bloody Mary, then the following places have you covered with a plethora of impressive garnishes. Everywhere I went on my Bloody Mary Tasting Tour of Austin, I heard tales far and wide of Casino El Camino infamous Bloody Mary. For good reason, it turns out, as the Frappy Mary is stacked high with garnishes such as bacon (lots of bacon! ), celery, pickled veggies, and cucumber slices. I’ve even seen pics of taquitos, chicken wings, and sliders crowning the cocktail. Legend has it that whatever is already fried up in the kitchen is fair game. Visitors can make their Frappy Mary as spicy or mild as they like. The 1-10 scale ranges from not spicy to ghost pepper. While the Austin food scene has become synonymous with long brunch wait times, it’s still possible to get away from the hustle and bustle at a neighborhood-style place. Enter District Kitchen + Cocktails in south Austin. The vibe is quaint, and all infusions and simple syrups are made in-house. 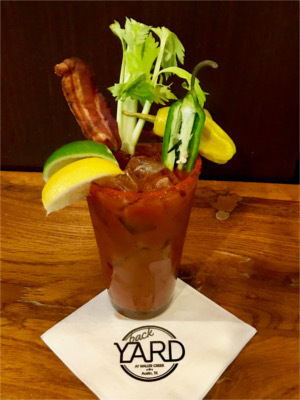 This makes District a stellar option if you want to get your Bloody fix, as Bloody Mary setups are available during brunch every Saturday and Sunday. Choose between Tito’s bacon-infused and Spicy Garden Medley vodka, then pick from a variety of pickled veggies, savory meats, and cheeses for garnish. 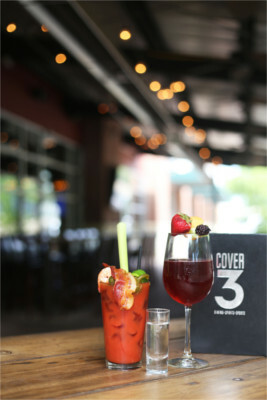 If you’re looking for a great place to watch the game and brunch, then COVER 3 has you, well, COVERED. On Saturday and Sunday, pull up a seat from 11 a.m. to 3 p.m. in front of one of many flat screens, and indulge in the U-Mix-It Bubbles and Bloody Mary Bar. 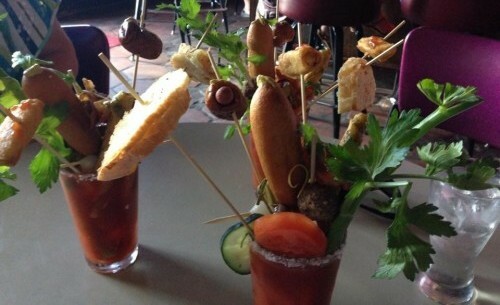 That’s right; you can be master of your own destiny…er…at least your Bloody Mary. First, choose your preferred vodka. Then your server will bring you a glass and send you off to the Bloody Mary station, where you can add mixes, spices, and condiments of your choosing. Don’t forget to pile high those savory and salty garnishes. Options include applewood smoked bacon, stuffed olives, house-pickled veggies, and celery–to name just a few. Go, team! With a name like The Red Headed Stranger, why wouldn’t you indulge? 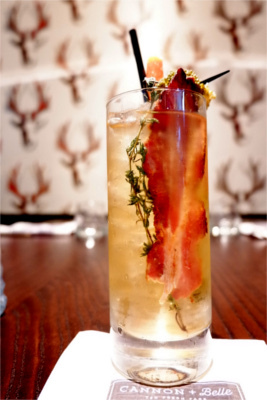 Frank’s take on the Bloody Mary features bacon-infused Tito’s Handmade Vodka, a house mix, and seasoned salt. An edible crown of bacon, cheddar cheese, jalapeño stuffed olives, and pepperoncini are placed upon the stranger’s head for your nibbling pleasure. In case you’re wondering, this Bloody Mary “can be made with regular ol’ boring vodka” if you so desire. Bloody Mary lets her hair down a bit, thanks to unique construction of the following cocktails. Savor one at the purveyors below to let your hair down, too! Austin’s whiskey distillery within city limits gets just about everything right: from producing a top-notch spirit, delicately blended into dreamy cocktails, to creating a one-of-a-kind place to kick back with friends around a fire and listen to live music. 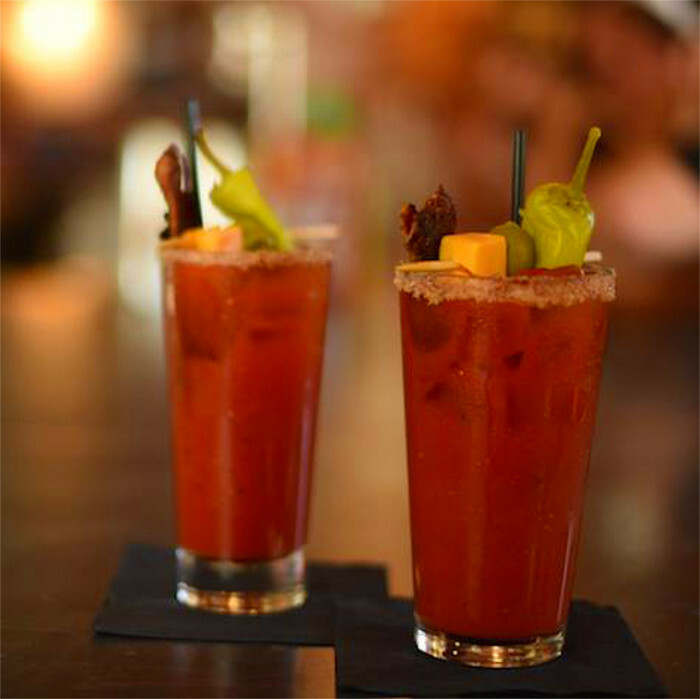 A finely made Bloody Mary on the menu is just another accomplishment Still Austin Whiskey Co. can add to the list. Quench your thirst with a delightful combination of New Make Whiskey and Bloody Revolution Mix. 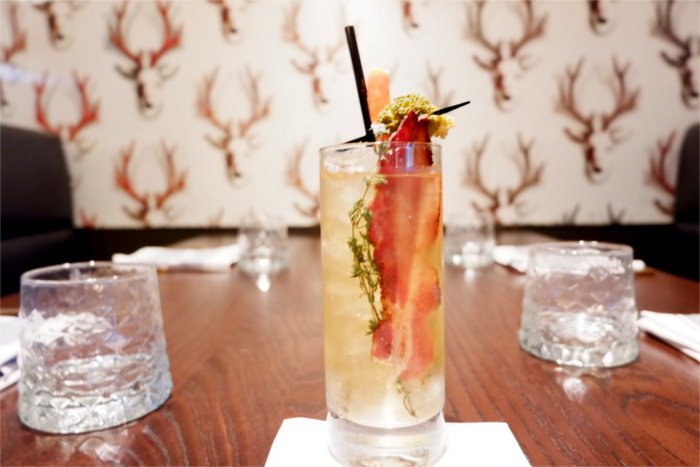 This drink will make you reimagine how whiskey can be enjoyed. Ghost of Mary is haunting guests of Cannon + Belle down on East 4th Street. If you stop in, you can experience the phantom for yourself. 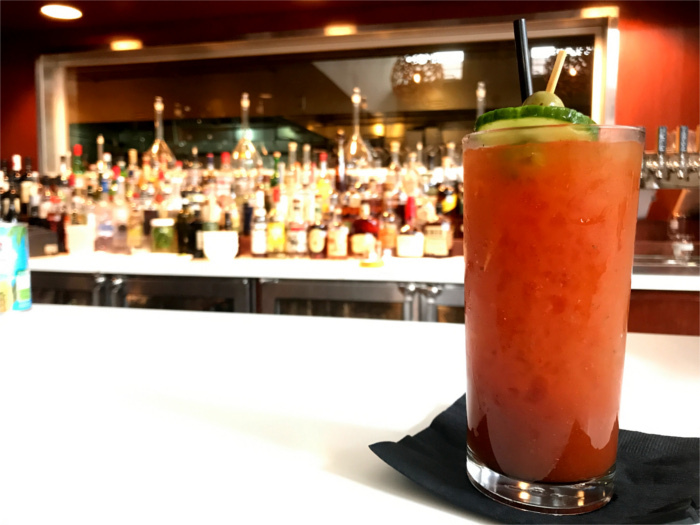 Cannon + Belle’s spooktacularly named version of the Bloody Mary get its moniker from its clear appearance, which can only be obtained by filtering tomato consommé several times to remove coloring and impurities. The filtered clear liquid is then mixed with Dripping Springs Vodka, a dash of Tabasco, and fresh ground pepper, and garnished with Habanero bacon and pickled vegetables. After a recent visit to Geraldine’s, I’m still trying to figure out whether its Bloody Mary, dubbed 24 Carat Magic, is in fact a reference to the Bruno Mars song, or whether it’s all just a coincidence. But I guess that’s neither here nor there. Technically, Geraldine’s orange-hued drink isn’t a Bloody Mary, since it lacks tomatoes. However, it does have plenty of vodka, and carrots are somewhat similar to tomatoes—yes? Anywho, take an elevator ride to the fourth floor of Hotel Van Zandt for this bright faux Mary and a stunning view of the city. Whether you like ’em spicy or mild, garnished or plain, the Bloody Mary is one of the most versatile cocktails. Austin knows how to make them well. 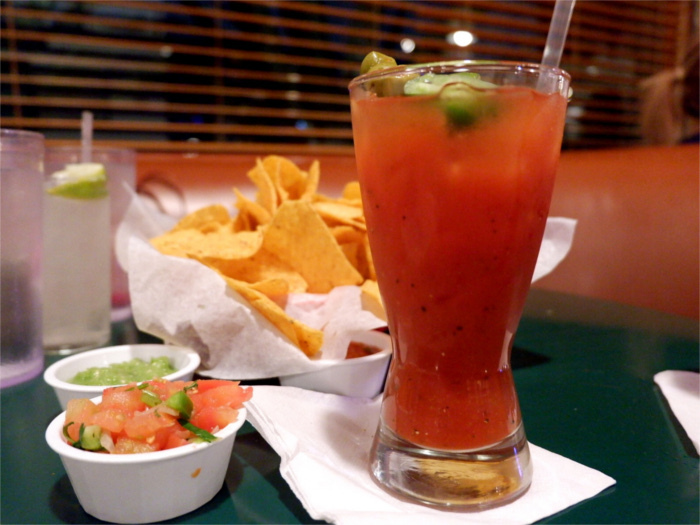 Where is your favorite place to get a Bloody Mary in Austin?